Periodic limb movement disorder (PLMD) is defined as the occurrence of periodic episodes of repetitive and highly stereotyped limb movements during sleep. Many secondary causes of PLMD such as age, narcolepsy, uremia, polyneuropathy, anemia, and pregnancy have been reported in literature.,,, To the best of our knowledge, this is the first reported case of PLMD secondary to insulinoma. A 54-year-old woman presented to the neurology clinic with a 5-year history of having episodes of repetitive leg movements during sleep occurring once or twice a week. She had no recall of these episodes, and these episodes were noticed by her husband. Relatives also noticed that since last 6 months she had abnormal behavior in the morning with incoherent speech, confusion, and sweating. They also noticed that during days when she used to fast for religious purposes her emotional responses were inappropriate. The affect and response time used to improve after having tea with unrefined sugar. She had no personal or family history of diabetes mellitus, and was not taking any oral hypoglycemic drugs. For these episodes, she was also given a trial of antiepileptic drugs but no improvement was observed. Neurological examination was within normal limits. Complete blood count, electrolytes, renal function tests, liver function tests, and random blood sugar levels were normal. No abnormalities were observed on brain magnetic resonance imaging (MRI) and interictal electroencephalogram (EEG). 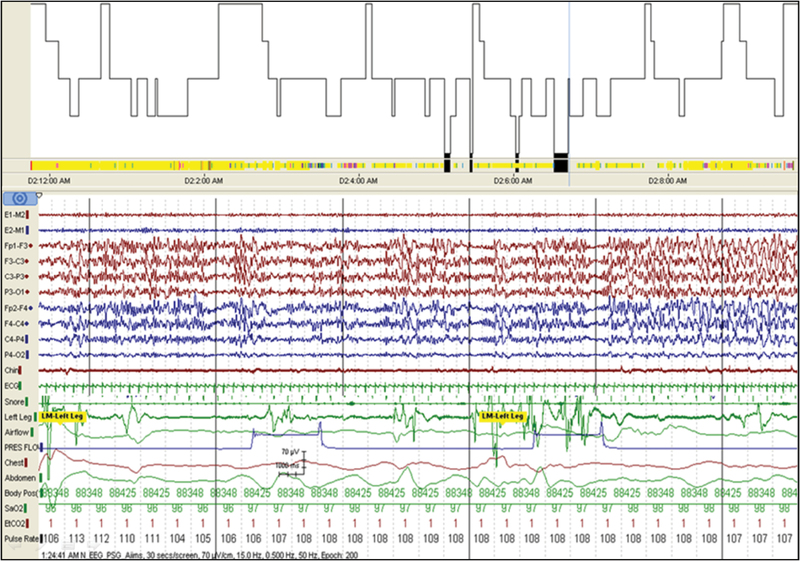 A working diagnosis of seizure was kept, and the patient was admitted and connected to video EEG to record these habitual episodes. Around 3h after the onset of sleep, the patient had abnormal rhythmic movements of both legs with flexion at the hip and knee, and extension of the ankle and toes, lasting for 5–15s [Video 1]. On reviewing the EEG, no epileptiform wave forms were observed during this episode. But there was slowing in background activity, followed by the appearance of generalized theta/delta activity that lasted for 30s. Blood sugar level measured during the episode by glucometer was 24mg/dL. To get more details regarding this episode during sleep, a video-polysomnography (PSG) monitoring in the sleep laboratory was performed. PSG [Figure 1] showed evidence of periodic limb movements in the form of a phasic increase in electromyography (EMG) amplitude in the lower limb channel, lasting for 4–6s at intervals of 5–10s. On evaluating the cause of these unprovoked hypoglycemic episodes, it was found that they were accompanied with an inappropriately high insulin level with elevated C-peptide levels, suggesting an endogenous source. Multiphasic computed tomography and MRI of abdomen revealed an arterial-enhancing lesion in the body of pancreas, which was removed surgically. Histopathology confirmed the lesion to be an insulinoma. The patient was followed up and was found to be symptom free. A repeat PSG was carried out, and it was found that the episodic abnormal leg movements had completely disappeared [Figure 2]. Our case highlights the need for neurologists to keep in mind that hypoglycemia can also be a rare cause of PLMD, and all efforts should be made to rule out this reversible disease. If such episodes are missed, then it may lead to potentially devastating consequences. All human and animal studies have been approved by the appropriate ethics committee and have, therefore, been performed in accordance with the ethical standards laid down in the 1964 Declaration of Helsinki and its later amendments. Ekbom KA. Restless leg syndrome. Acta Neurol Scand 1945;1:4. Coleman RM. Periodic movements in sleep (nocturnal myoclonus) and restless legs syndrome. In: Guilleminault C, editor. Sleeping and waking disorders: indications and techniques.Menlo Park:Addison-Wesley;1982.1.265–95. Ancoli-Israel S, Kripke DF, Mason W, Kaplan OJ. 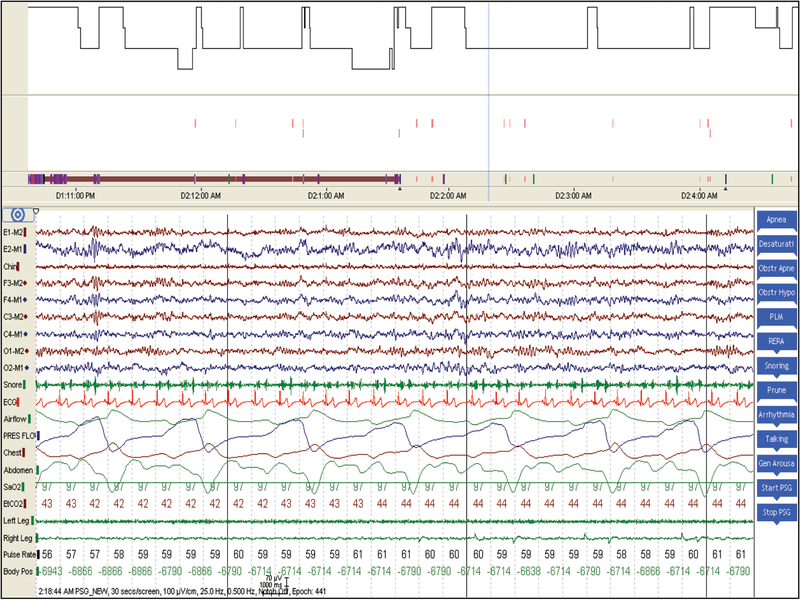 Sleep apnea and periodic movements in an aging sample. J Gerontol 1985;1:419-25. Vetrugno R, D’Angelo R, Montagna P. Periodic limb movements in sleep and periodic limb movement disorder. Neurol Sci 2007;1:S9-14. Beisang D, Forlenza GP, Luquette M, Sarafoglou K. Sporadic insulinoma presenting as early morning night terrors. Pediatrics 2017;1:e20162007. Shaw C, Haas L, Miller D, Delahunt J. A case report of paroxysmal dystonic choreoathetosis due to hypoglycaemia induced by an insulinoma. J Neurol Neurosurg Psychiatry 1996;1:194-5. Lee KT, Arnott RD, McLean CA, Serpell JW, Topliss DJ. Corticotropin-independent macronodular adrenal hyperplasia associated with insulinoma. Endocr Pract 2011;1:e43-7. Tan NC, Tan AK, Sitoh YY, Loh KC, Leow MK, Tjia HT. Paroxysmal exercise-induced dystonia associated with hypoglycaemia induced by an insulinoma. J Neurol 2002;1:1615-6. Unger JW, Moss AM, Livingston JN. Immunohistochemical localization of insulin receptors and phosphotyrosine in the brainstem of the adult rat. Neuroscience 1991;1:853-61. Maestri M, Monzani F, Bonanni E, Di Coscio E, Cignoni F, Dardano A, et al. Insulinoma presenting as idiopathic hypersomnia. Neurol Sci 2010;1:349-52. Suzuki K, Kawasaki A, Miyamoto M, Miyamoto T, Kanbayashi T, Sato M, et al. Insulinoma masquerading as rapid eye movement sleep behavior disorder: Case series and literature review. Medicine (Baltimore) 2015;1:e1065.